Riots and rainbows notwithstanding, I often feel that the appropriate name for a group of colors is a celebration. There is really nothing else I feel like doing when confronted with beautiful shades of color. I began yesterday’s dyeing as I always do; I sat down with my color sampler cards and matched colors. 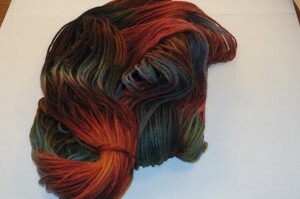 Since I was dyeing for friends, I pulled colors that fit one person, and then colors that fit the other. Then I threw in a few more that I wanted to play with for a project that’s percolating in the back of my mind. That might seem like a lot of colors, but since many of them are shades of the same dye (gotten by using different dilutions) or mixtures of a set of base dyes, I ended up with only 5 main colors, plus black to work from. I think I did end up throwing in two other accent colors, but I usually try to stick to 3-5 dyes per session. 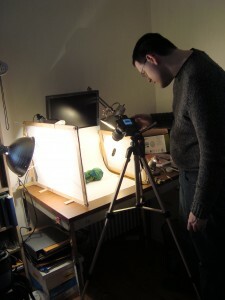 It keeps things manageable, and it allows me to fully explore the possibilities contained in those little jars of magic. I began with the roving, since it’s a little more finicky and it was the star of the day. 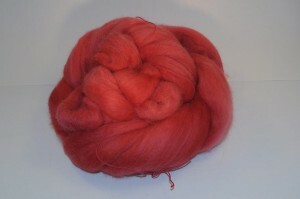 Despite my worries about that silly scarlet dye, the roving turned out to be the perfect pink, somewhere between salmon and sunset. To my surprise, the greens gave me a little more trouble. I’ve gotten used to adding extra dye, or increasing the concentration to match the colors on my sample cards, but apparently yesterday I had no need of extra. I was aiming for something lighter, with a stronger presence of gray, but if I put my expectations aside I am deeply in love with the greens that came out. The blues were also much darker than I was aiming for, but darker blue is hardly ever something you’ll hear me complain about. Next time I will cut down on the saturation for both of these colors, but today I am glorying in their depth. My absolute favorite of the day was a long shot (it often is). 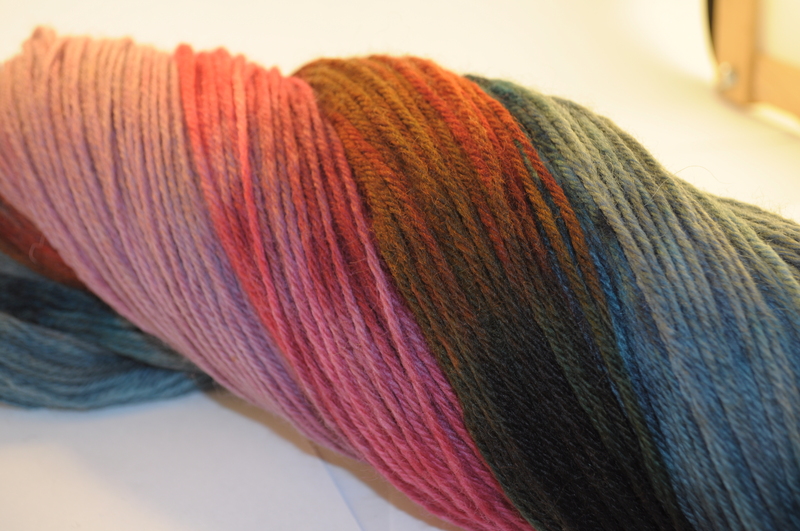 I took a bunch of strong colors in heavy saturations, and I laid them in stripes of varying width all along a skein of yarn. It has a little of everything, from reds and orange to blues and even a little yellow. And I absolutely love it. Do you see that fire? 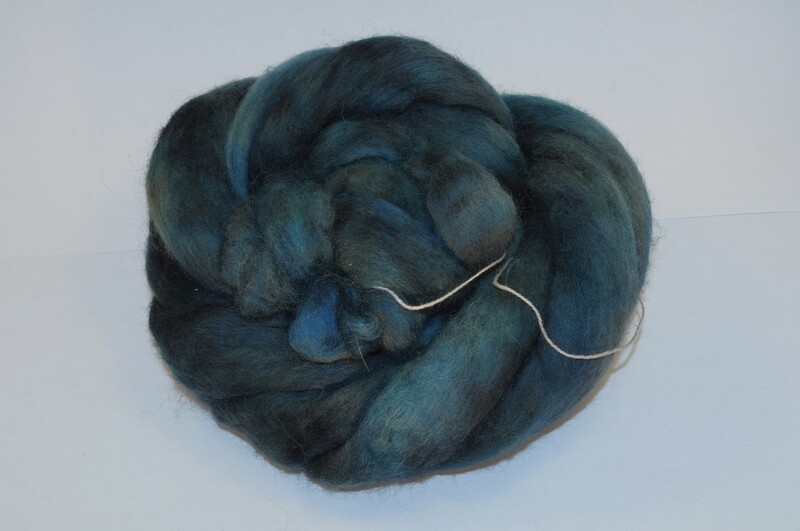 The next skein was much closer to what I’d expected for the roving. A paler, more subdued blue shot through with gray. 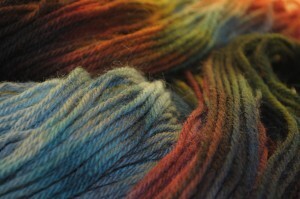 It’s like they were made to go together, when really that was the farthest thing from my mind when dyeing. 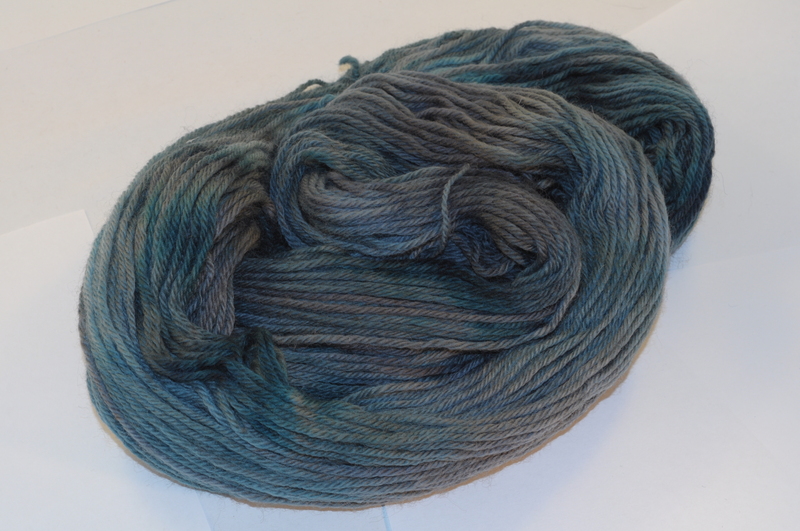 The same thing happened with the last two skeins. 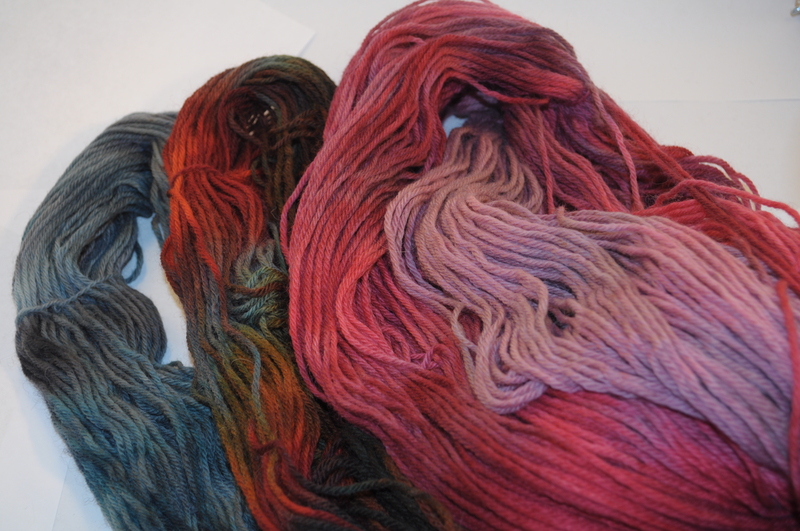 The one on the right is dyed very much like the first roving; a combination of different saturations of scarlet and fire red, this time mixed with just a little gray to tone it down. 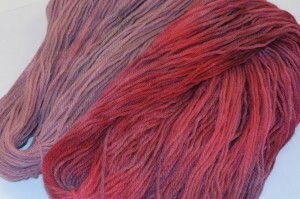 The skein on the left is my “serendipity” skein. At the end of the day, when the dye jars are getting close to empty and my wash jar (where I rinse the spoons as I measure) is getting to be a deep, saturated color, I mix whatever is left over and not enough to be worth saving and use that to dye the last skein. It’s funny: every time I encourage people to mix colors on their yarn, they say they’re afraid of creating mud. 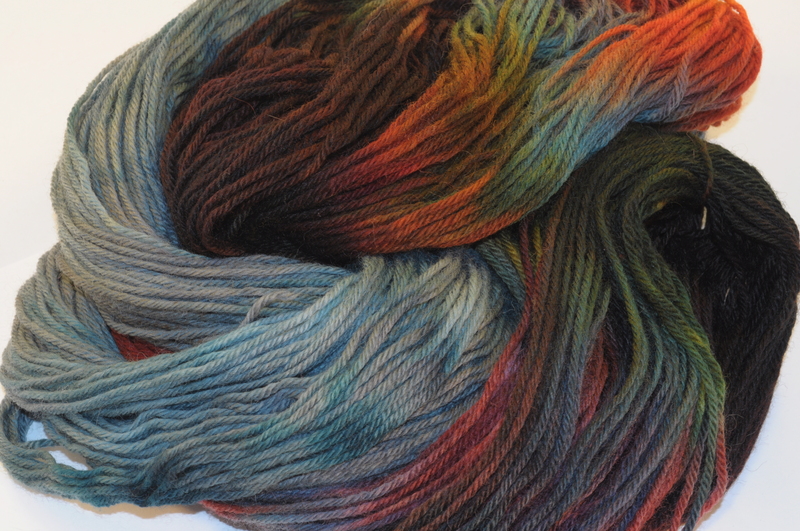 Every time I dye, I mix everything randomly, and usually get something beautiful. 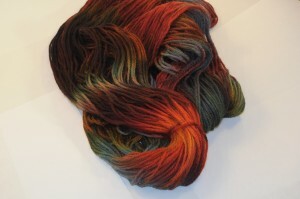 This particular serendipity skein is a mixture of two reds, a teal, an orange, and a yellow dye, plus liberal sprinklings of black. There may also be some brown and a little pure blue thrown in. To me, it looks like the sunset. And again, all of these very different skeins fall into harmony with one another in unexpected ways. Yes, I think color should be called a celebration. The more I dye, the more I realize how much pleasure it brings me to put color on fiber. I love to see how it develops, how it takes these strange and often unexpected turns to become so much more than I could have expected from looking at my samples alone. The problem is, I don’t need any more yarn. 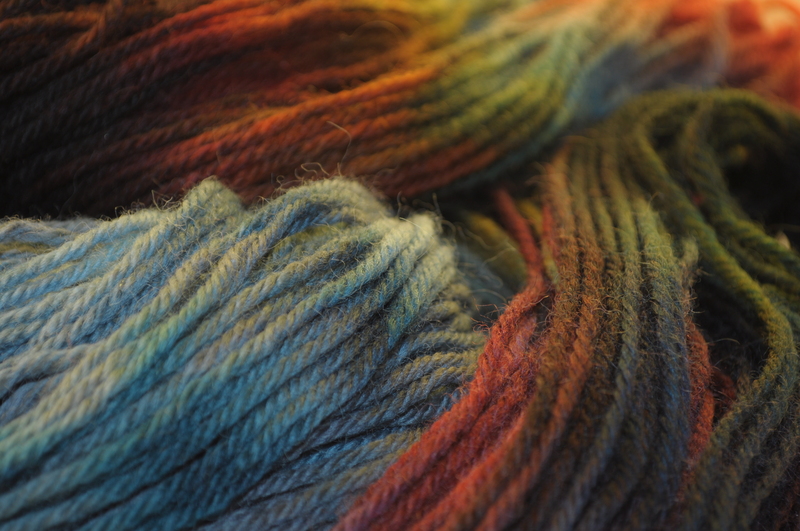 I have enough, and though I love each and every one of these skeins, it’s the creation that I enjoy, and not the possession. And so, today, we began another project. One that Branden has been suggesting for a long, long time, and one that I am finally becoming ready to embrace. And we’re beginning the process of setting up a small shop over on Etsy. It’s not ready yet, but it’s coming. 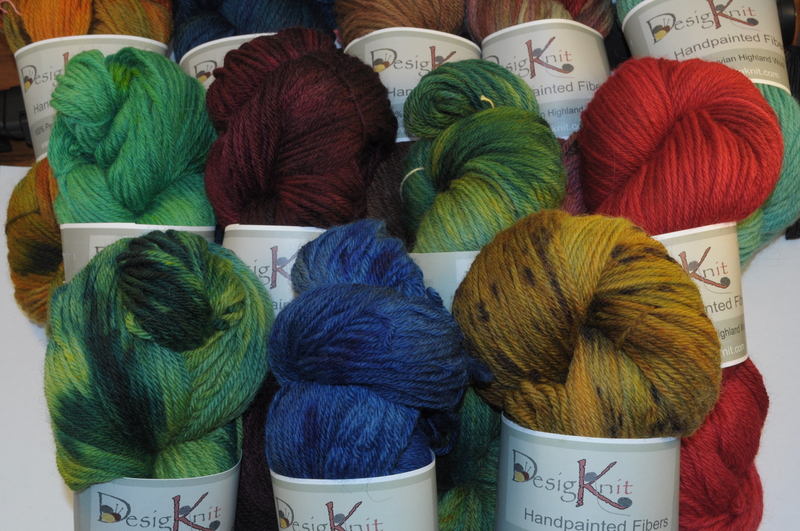 We’re busy creating a place for all these colors, so that I have room to make more. 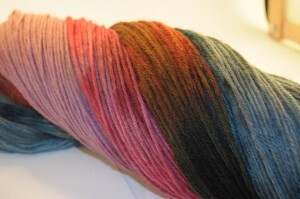 Oooh…the roving colors are gorgeous. I think though, of all your experiments here, I like the serendipity skein the best. Lovely. Hooray! Good for you 🙂 I can’t wait to hear how it goes. 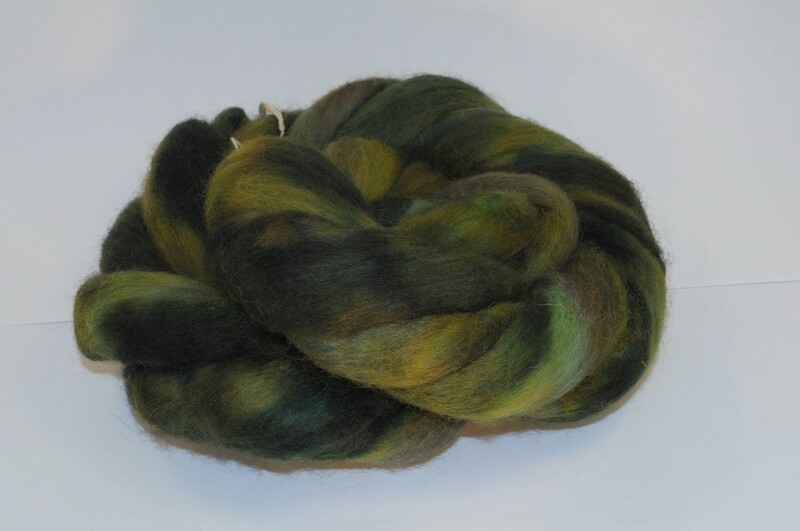 You will be putting rovings on the site, too, right???? DesigKnit is powered by	WordPress 4.8.9 . Page generated in 0.304 seconds using 42 queries.